The U.S. flag is lowered to half mast in front of a damaged fence of the U.S. embassy after Hurricane Irma caused flooding and a blackout, in Havana, Cuba, Sept. 11, 2017. Secretary of State Rex Tillerson said Sunday that the United States is considering closing its embassy in Cuba following a number of "health attacks" on American diplomats there. “We have it under evaluation. It's a very serious issue with respect to the harm that certain individuals have suffered. We've brought some of those people home. It's under review,'' Tillerson said on the CBS television show "Face the Nation." 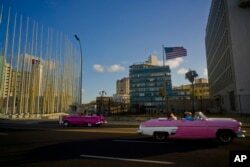 FILE - Tourists ride in classic American convertible cars past the United States embassy, right, in Havana, Cuba, Jan. 12, 2017. At least 21 Americans have suffered what the State Department calls "incidents" that have led to a variety of symptoms, including hearing loss, concussions, headaches, ear-ringing, and even problems with concentration and common word recall. Some Canadian diplomats and their families have also been affected. Some felt vibrations or heard loud sounds mysteriously audible in only parts of rooms, leading investigators to consider a potential “sonic attack.” Others heard nothing but later developed symptoms. Though investigators have explored the possibility of sonic waves or an electromagnetic weapon, no culprit or device has yet been identified, the Associated Press reports. The incidents began late last year and the most recent was reported in August. Lawmakers in Washington have raised alarm over the incidents. On Friday, five Republican senators wrote Tillerson to call for both closing the Havana embassy and expelling all Cuban diplomats from the United States. “Cuba's neglect of its duty to protect our diplomats and their families cannot go unchallenged,'' said the lawmakers, who included Sen. Tom Cotton of Arkansas, who led the effort, and Sen. Marco Rubio of Florida, a prominent Cuban-American and critic of the U.S. détente with Cuba. Cuba has denied involvement and has said it is cooperating in the investigation into the attacks. The United States has not blamed Cuba directly for the attacks, but asked two Cuban diplomats to leave Washington earlier this year. Former President Barack Obama re-established ties with the Caribbean island nation two years ago, a move that has been criticized and threatened by his successor Donald Trump.